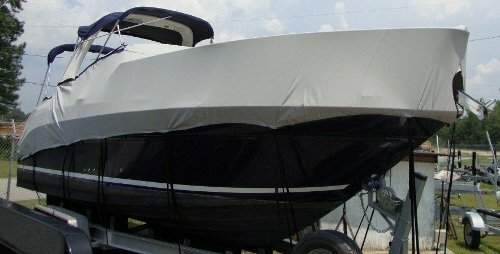 Our covers for high profile cabin cruisers with radar arches are made for boats such as Bayliner Ciera, Sea Ray Sundancer, Regal Commodore, and Larson Cabrio. These covers are made with a hook and loop (like Velcro) slot that runs along the side of the boat cover length wise, allowing the arch to exit. This slot is 115” long and will start anywhere from 158” to 201” back from the start of the bow, depending on the size cover ordered. The slot allows for approximately 82” of width between legs of the arch. If you have an anchor roller, the cover will allow for it to exit. It features an opening at the tip of the bow which is designed to let an anchor roller stick through. However, if you have a bow pulpit, you should order a cover in a size large enough to accommodate for it. Because a bow pulpit is a little taller than a roller, it will not fit through the slot completely, meaning you will need a longer cover to go over it. This cover will accommodate for bow rails up to 30” in height. There is a draw rope within the hem of the cover which exits at both the port and starboard side. This allows you to pull the cover tight in the hem so that it fits snugly against the boat. Two rope ratchets are included with the cover to aid in tightening the draw rope. The cover is designed to come down approximately 3-6” below your rubrail. It has loops sewn throughout the hem one every 2-3'. These are to be used with the included tie down straps. Twelve straps come with the cover, which will be sufficient for trailering a boat of up to about 23'. Simply use four straps on each side, two in the front, and two in the back. These straps are 8' in length and they can be shortened using an adjuster. Quick release buckles allow you to easily connect and disconnect your straps. Snap patches are sewn into the inside of the cover for use with our boat cover support poles. Our support poles are adjustable in height and they feature a male snap on top. This male snap is made to snap into the female snap patch which is sewn to the inside of the cover. Once your boat cover support pole is affixed to the covers interior snap patch, and adjusted to the proper height, it will work to create a high point in the cover and allow water to run off efficiently, ensuring that moisture is not allowed to pool on the top of your cover. This cover for a high profile cabin cruiser with radar arch is Made in the USA by Carver Industries. It comes in high quality materials Poly-Guard and Sun-DURA, both of which are also made and obtained within the USA. These materials are heavy duty marine grade polyesters which are excellent for outdoor storage, water repellency, UV resistance and trailering. Poly-Guard comes in Gray, Beige, and White and is the best of the two for breathability. Sun-DURA comes in over ten colors and has a bit more water repellency. Both materials will offer great protection for your boat and will last you for many years to come. Poly-Guard and Sun-DURA are warrantied for five and seven years respectively.